Burda, Burda, Burda. I love your patterns, but your instructions are confounding. 1. 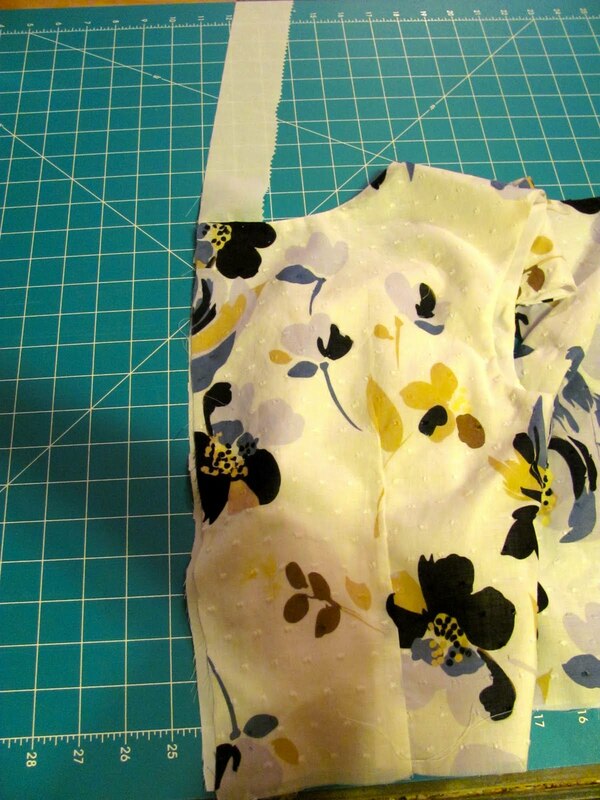 Cut out your bodice pieces from BOTH the MAIN FABRIC and the LINING FABRIC. 2. Mark the darts with non-wax tracing paper. 4. MAIN FABRIC: With right sides together, sew the shoulder seams together. Repeat with LINING FABRIC. Press seams open. 5. 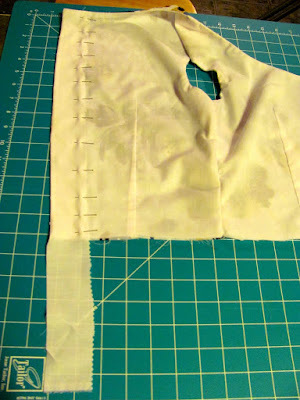 With right sides together, sew the MAIN FABRIC to the LINING FABRIC along the arm holes and neck line. Press the seams open. NOTE: You have not sewn any side seams yet. 6. Turn the bodice right side out by pulling the two back pieces through the shoulders. Press seams. 7. Open the MAIN FABRIC and LINING up at the side seam (which is not yet sewn). Match the arm hole seams and edges - MAIN FABRIC to MAIN FABRIC and LINING to LINING. Pin, with right sides together. Make sure the arm hole seams lie flat. Sew the side seam. Repeat on the other side. 8. Your options now are to put a zipper up the back of the dress or buttons. 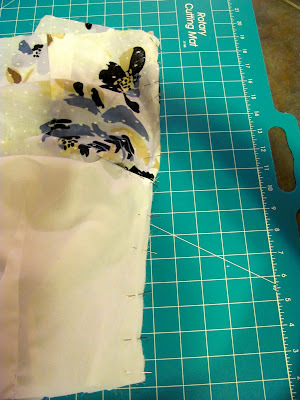 If you choose to buttons you will need to make a button placket. 1. Cut two strips of one of your fabrics. I used the LINING FABRIC. The strips should be 2" wide and however long your bodice is. 3. 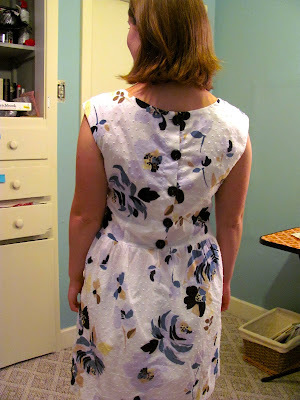 Turn the garment so that you can put the neckline right sides together. Insert the end of one of the strips and line it up with the center back edge. Resew the ripped part of the neckline seam and turn right side out again. Your strip should now be sticking out of the seam. 4. Fold the strip down the right side of the MAIN FABRIC and pin the edge to the center back edge. Sorry, this photo is from the opposite side from the last photo. I also used pinking sheers on the other side of the strip so I wouldn't have to hem it. 5. Sew the edge of the strip to the center back edge, catching both the MAIN FABRIC and the LINING FABRIC. 6. 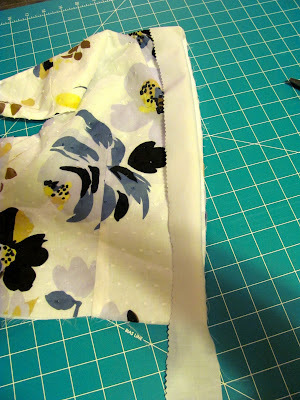 Turn the strip to the inside of the garment, gently poking out the corner. Press the seam down. If the seam is bulky, clip the seam allowance. 7. On the inside of the garment, pin the open edge of the strip down. Sew the other edge of the strip down, about a quarter inch from the edge. 8. Repeat on the other side of the center back seam. As you can see, I had extra length on the strips. If you do, just cut it off at the end. The strips only need to be as long as your bodice. 9. Before sewing the skirt onto the garment, overlap the button plackets and hand baste them together at the base of the bodice. Then use the Burda instructions to sew the skirt onto the garment. 10. Decide how many buttons you want to use. I used 5. 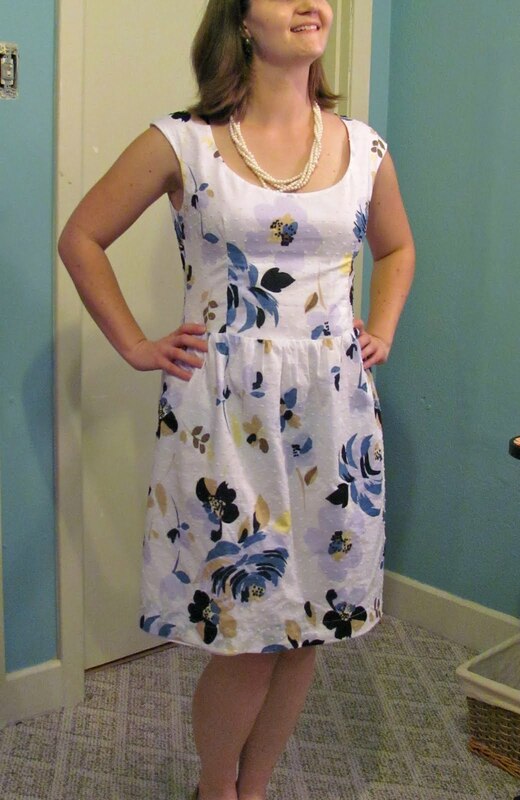 Place one button at the neckline and one at the skirt line. Evenly space the other buttons between these two. I used a ruler. On the side that lies on top, mark where the button holes should go based on where you want the buttons. Follow your sewing machine manual instructions for making a button hole. I did a test run on some scrap fabric. 11. REMEMBER: put your button holes on the placket that lies on top of the other placket. The buttons should be sewing to the lower placket. Sew your buttons on. Super helpful! Thanks for posting this! I'm about to start making my dress muslin, but couldn't quite wrap my head around the instructions, so I'm really glad I found your post! Great job ..... I'm so glad to find this tutorial as I've been struggling how to make head or tail of the instructions!!! Now I'm all cut out and ready to go. I'm so glad others are finding this helpful! I wish I had taken better pictures from the process - but at least its a start! Thanks for posting this! I just got this pattern a few days ago and your tutorial is really helping.